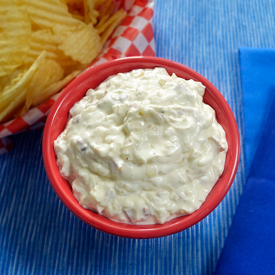 To me, chip dip screams summertime. It seems like whenever I’m scooping a mouthful onto a wavy potato chip I’m either at a lake for a picnic or an outdoor party in the heat of summer. The one exception is Super Bowl Sunday, but that is the pinnacle of party food and dips are a requirement. 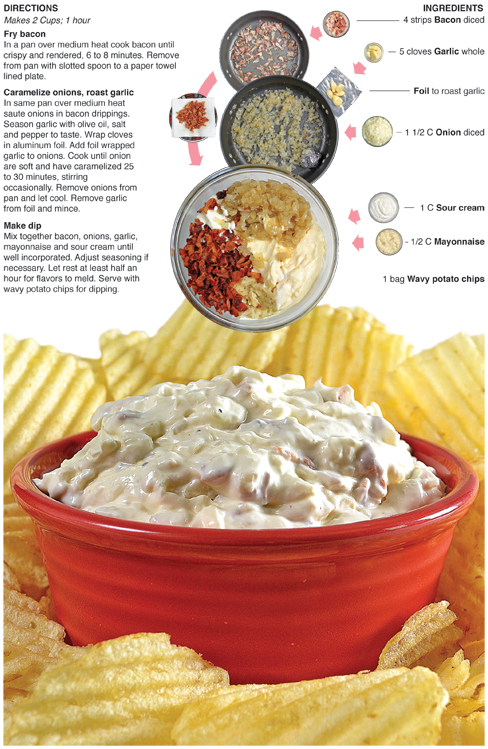 For this recipe, I decided to revisit a classic that I had made a couple of years ago for my print column - French Onion Dip, only this time I add bacon. 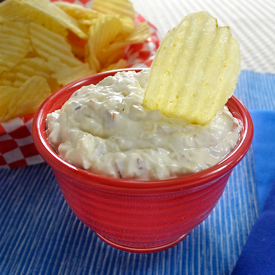 The secret to making this dip delicious is not the onions or the bacon – it’s the roasted garlic, which provides a savory balance to the sweetness of the caramelized onions and gives the dip depth of flavor. I tried something I have never done before to cook the garlic for this dish. Instead of roasting it in the oven, I wrapped it in foil with a little olive oil, salt and pepper and tossed it into the pot with the onions. After a half an hour it was perfectly roasted and ready for me to mince and put in the dip. The foil worked perfect as a little garlic roaster. In the end, this dip was outrageously good. The homemade version just blows any store-bought french onion dip out of the water. It will be a highlight in any spread at a party. As I mention in the beginning, it has been a couple of years since I have made homemade chip dip and I had forgotten how delicious it is. I destroyed about a half a bag of chips after I made this stuff and had to force myself to put it away. It seems like over the last few weeks I had been putting together some huge posts with tons of pictures and steps. This dip was a conscious effort to make something simple that wouldn’t take hours to photograph and reproduce in an information graphic. I had done a couple of tacos (here & here) recently that contain as many photos and steps as I usually do in two or three posts. I wanted a simple recipe that would come together quick. 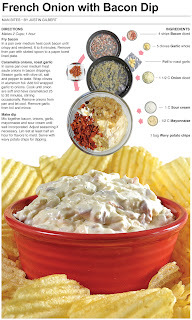 If you’re a fan of dips I highly recommend trying this, but make sure there is enough chips around because it’s pretty easy to polish off an entire bag with a bowl of it on the counter. In a pan over medium heat cook bacon until crispy and rendered, 6 to 8 minutes. Remove from pan with slotted spoon to a paper towel lined plate. In same pan over medium heat saute onions in bacon drippings. Season garlic with olive oil, salt and pepper to taste. Wrap cloves in aluminum foil. Add foil wrapped garlic to onions. Cook until onion are soft and have caramelized 25 to 30 minutes, stirring occasionally. Remove onions from pan and let cool. Remove garlic from foil and mince. Mix together bacon, onions, garlic, mayonnaise and sour cream until well incorporated. Adjust seasoning if necessary. Let rest at least half an hour for flavors to meld. Serve with wavy potato chips for dipping.